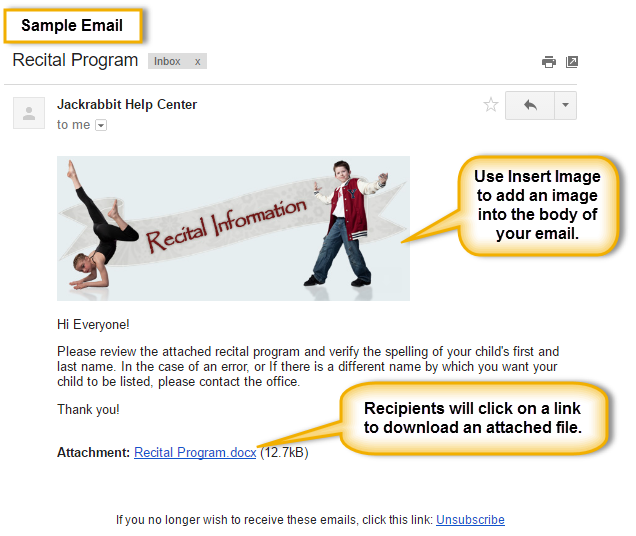 Once you have uploaded your Jackrabbit files, you can quickly attach the files or insert the images into your emails. Click the Attach File button in the Message section of the email screen (Email/Text Families, Email/Text Staff, Email/Text Class, Email individual Family/Student/Staff). Upload a new file from your computer or select a file that you have previously uploaded to your Jackrabbit files. You can select multiple files to attach at one time. Click Attach # Files (where x is the number of selected files). The attachment(s) will appear in the email as a link your customers can click on to download the file immediately. Click Insert Image in the Message section of the Email screen (Email/Text Families, Email/Text Staff, Email/Text Class, Email individual Family/Student/Staff). Upload a new image from your computer or select an image that you have previously uploaded to your Jackrabbit files. You can select multiple images to attach at one time. Click Insert # Images (where x is the number of selected images). The image(s) will appear directly in the body of the email. Note: Some email clients will not allow the user to view images until they confirm you are a trusted sender. If you use the Attach File button to add an image to an email instead of the Insert Image button the recipient will have to click on the link to view the image.